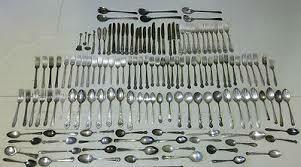 It is Common to Find Large Lots of Vintage Silverware at Thrift Stores for 10c Each! You can Sell Silverware for Excellent Profit Margins. In this unique post, you will learn how to sell silverware and flatware found at garage sales and thrift stores for excellent profit. 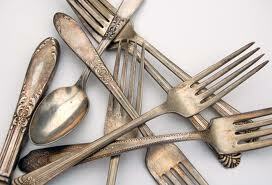 Individual pieces of silverware can often be found for 10c each, or in bags or boxes for $1-5. These large lots of silverware can easily yield over $100 in profit, if the majority of the pieces are vintage or a high-end name brand. This is one area of vintage eBay collectibles that is not just common sense. You have to do your research and know what you are looking for and what terms must be in your titles and descriptions when selling silverware and selling flatware on eBay, Etsy and Amazon. Sterling Silver: The highest average value of silverware is Sterling Silver, which is a silver allow that contains at least 92.5% silver, and usually 7.5% copper. Most sterling items are stamped ‘Sterling’ or ‘925’, along with a maker’s mark, but some are not. Silver Plate: The mid-range silverware and flatware is Silver plate, which is really only a thin layer of silver electroplated over a copper or nickel base. Where sterling flatware always holds value due to the silver melt value, plated items rely on collector demand to retain value. Stainless Steel Flatware: Generally the least valuable of flatware is made of stainless steel. Still, some stainless flatware patterns can make some nice profits when found for cheap, even over $200 for sets of Oneida and Rogers Stainless. Vintage Silverware: Generally anything over 25 years old qualifies as vintage or antique. Many Garage Sale Hosts Have No Idea of the Value of Mid Century Modern Stainless Flatware, like These Bakelite Handled Pieces. Mid Century Modern: Generally accepted to mean the post World War 2 time period from 1945-1970, but the peak of the movement was 1950-1965. Items in this movement were characterized by a style of decor, homes and furniture that was sleek, contoured, and defined by geometric shapes and curves instead of the preceding style of busy decorations and accessories. Mod decor items were often made of Bakelite and Melamine. Harvest orange and Avocado green were popular colors. Bakelite: Many of the decorative items, electronic shells, and furniture accessories of the period were made of Bakelite, an acrylic plastic resin. The substance appears opaque, which creates vibrant retro colors that are highly sought after by collectors. 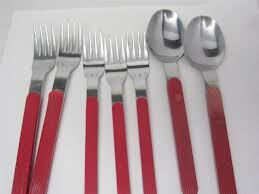 Many flatware sets had handles made of bakelite, and they are collectible. Click HERE for 6 methods used to positively identify whether an item is Bakelite or not. Sterling Silverware Often Appears Duller in Color or Lightly Tarnished. Most Stainless Steel Silverware is Bright and Shiny. Silverware is very commonly found at garage sales and thrift stores, yet many eBay sellers do not know how to effectively sell silverware. Many cannot even identify sterling silver pieces, which are highly sought after due to silver value. I have found a LOT of sterling pieces at garage sales for cheap, including a fair amount of sterling silverware and serving pieces. Sellers have to do their research and know how to identify sterling silver pieces by their markings and characteristics. There are many excellent online sources of information on identifying sterling silver and maker marks. Locating vintage silverware and flatware items is surprisingly easy. Everybody has silverware, right? It’s amazing how many people save old silverware, and even more amazing how few know about the value of some of these flatware sets and pieces. Look at as many photos of these items as you can on the internet and in books BEFORE you go inventory picking. Know some of the commonly found and valuable patterns and manufacturers by sight. Look in the free boxes. I have found many silverware pieces for free, including sterling pieces. Now that you have gone out and got some great pieces, how do we sell silverware and flatware effectively?I have found that there are three things that you can easily do to maximize your profits when you sell them on Etsy, or eBay. Remember, the key to ANY listing on either site is to get people to notice your item in the search lists and category lists. How do we do that? The thumbnail photo must be eye catching and the title must be interesting and tell potential bidders what they need to know. 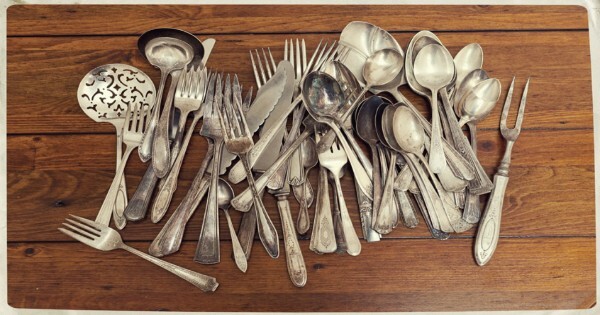 A Very Nicely Photographed Lot of Vintage Silverware. What do You Think Will Get More Bids, a Photo Like This or a Photo of a Bunch of Old Spoons in a Box? When you begin to sell silverware pieces, you will notice right away what sets the higher priced patterns apart. They are very unique and visually appealing. Make sure that your thumbnail photo shows the most appealing feature of the product. You can make your item ‘pop’ even more by using a good background behind the utensils. Look at how successful auctions have used their thumbnails for similar items. Use your title effectively. 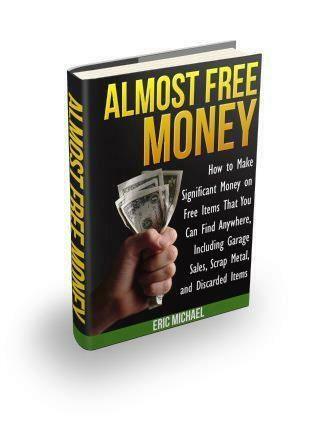 Generate interest without sounding fake. Don’t use All Caps, exclamation points, or bold. Don’t use words like Rare, Scarce, or Must-Have. These make your auction look unprofessional. Experienced sellers very seldom use these terms. My best advice is to go to the Silverware category on eBay. Click completed listings, and sort by High Price. Then start writing down words that are used in auctions that ended at high prices or got a lot of bids. This goes hand-in-hand with #2. Know the lingo of collectors when you sell silverware. Know what words they are looking for in titles, and be able to describe item condition effectively. Make SURE that if you are calling an item Sterling, that it is indeed Sterling and not Silver-plate. Group sets or place setting of silverware patterns together when you sell silverware, whether it is sterling or silver-plate. Some eBay sellers have done very well by selling low-end silver-plate flatware lots in one lot. Fill a flat rate box full of silver-plate weigh it and offer it for sale. I recently saw one lot of 23 LBS of silver-plate sell for $500 on eBay. People also buy “junk” silverware to make crafts or art out of. Sell in large lots on Etsy or eBay. Replacements.com is an excellent resource to sell silverware and other serving-ware and china. The site has excellent pattern identification help, and they also buy pieces and sets from internet sellers. You look up your pieces, and submit a list of what you have. They send you back an offer for what they are interested in buying from you. You ship them your pieces, and they pay you. How to Sell Silverware: Making Money with Stainless Flatware found at Thrift Stores and Garage Sales – Thanks, Rudy! *** Thank you very much to our friend Rudy Randazzo for providing information on stainless flatware in a guest post for Garage Sale Talk. Stainless steel flatware was an area that I did not have a lot of experience in. Rudy has been selling stainless flatware for years on eBay with very good results. Have you ever walked into an estate sale late and seen nothing but stuffed animals and a drawer full of forks and knives? Seems like a bummer…but there could be hidden gems right in front of your eyes. If you aren’t already buying and selling flatware, it’s time to take a second look. These items are usually a steal at garage sales and estate sales and can produce fantastic profits at online auction sites like eBay. When it comes to flatware – patterns mean everything. Some patterns will bring $50.00 or more per piece, and others won’t even sell for scrap value. The best way to familiarize yourself with the top patterns is to go to the eBay website and search “vintage stainless flatware”. Next sort by auctions only, and then “number of bids most first”. Focus on the patterns generating the most bids. Some patterns were manufactured in limited runs and remain eternally popular. They are therefore always a good bet. (Classic examples are the Towle “Beaded Antique” pattern – especially the original German made pieces – and the Washington Forge “Town and Country” pattern). Like all vintage/antique items, however, the popularity of most flatware patterns ebbs and flows along with the popularity of the artistic/aesthetic movement with which the pattern is associated. The post-“Made Men” resurrection of modernism has caused a feeding frenzy for all things mod – especially streamlined mid-century Danish Modern pieces. Fortunately for us, there is a bevy of Danish modern patterns stashed away in drawers, garages and biscuit tins around the country. Some of the best selling patterns are “Magnum” by Lauffer (a/k/a Towle), “Odin” by Dansk and “Heirloom” by Oneida. Even a single spoon, fork or knife in one of these patterns is worth buying and reselling. The prudent “picker” should memorize these patterns, at a minimum. 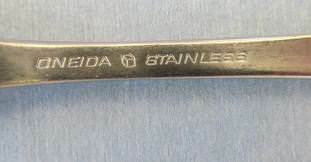 Rudy Looks for Vintage Oneida Stainless Flatware with Cube Logo, as Seen on This Knife. As you start paying attention to flatware, you will notice a lot of it is marked either Oneida, Oneida Community or Oneida Craft. These pieces were manufactured and marketed by the Oneida Company and there is a market for almost every one of them. Some exceed $50.00 per piece, but most of them are in the $2.00 per piece or less category (though even these cheaper patterns usually sell well in sets). Because of the commonality of Oneida pieces, and the incredible abundance of Oneida patterns, it is important to familiarize yourself with some of the “Oneida Basics”. Generally, the best Oneida patterns are the so called vintage “cube marked” pieces. These pieces will all have a three dimensional cube logo next to the Oneida name. These cube marked pieces are heavy, high quality stainless steel. You should not be able to bend a “cube marked” teaspoon with your bare hands (unless you are Mr. Universe). Most stainless flatware is best sold at a fixed price. You have to remember that vintage flatware is not something that is usually purchased on a whim – rather the majority of buyers are seeking to replace lost or broken pieces from family sets or wedding gifts. You may therefore have to wait for the person who needs the pattern you have to come along. If you do not know the pattern of the flatware you are selling, don’t bother listing it. People searching for replacement pieces are not inclined to look through the thousands of listings on eBay to try to find their pattern. For that same reason, it is obviously important to put the pattern name in the title of your listing. Pricing is best based on the current replacements.com price for the same piece. You should generally look to get 50-75% of the going replacements.com price. You will get the best return if you sell individual pieces – but for the cheaper patterns, this can be a tedious process. 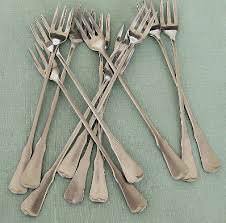 A good rule of thumb is to sell pieces valued at $7.00 or more individually, pieces valued at $3.00-$7.00 by the five piece place setting (Spoon, Tea Spoon, Dinner Fork, Cake/Salad Fork and Dinner Knife) and pieces valued at less than three dollars by the set or partial set. You should be able to ship up to 5 pieces by first class mail. After that, the best method is by USPS Priority Mail Flat Rate Box (angle dinner knives to fit them in the small USPS flat rate box). Vintage Specialty Utensils like These Cocktail / Seafood Forks can Bring Top Dollar When You Sell Silverware on eBay. 1. Keep your eyes peeled for unusual pieces: Iced tea spoons, cocktail forks, sauce spoons, demitasse spoons. These pieces will usually, though not always, bring a premium over the regular pieces. 2. Look out for children’s pieces in popular patterns. They look just like the regular pieces except smaller. These pieces will bring a premium. At the least, arrange your silverware by pattern and sell them as a lot. If you have a complete silverware set, or many pieces of vintage flatware, you may want to sell silverware on eBay in order to sell for a much higher price. 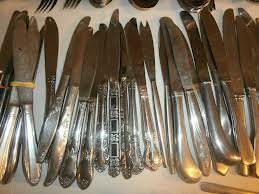 If your antique silverware has been in storage, you should make them look presentable by cleaning them or running stainless flatware through the dishwasher. Selling silverware for profit is a fun and unique way for garage sale flippers to make money on eBay. Learn how to identify high-end silverware and how to sell it for maximum profit.